June 20, 1995. That's how it looked in the box score. Pity the poor hockey fan who didn't see it happen, and only saw this in print the next day. The question is often asked: what's the greatest play you've ever seen? For sports fans, it usually involves a superstar like Michael Jordan or Joe Montana, presumably executing a clutch play during an important playoff game. If you narrow it down to just hockey, the greatest moment would also lean toward some sort of overtime heroics from the Stanley Cup playoffs. 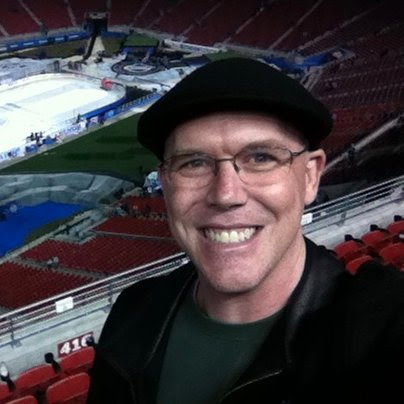 But for this hockey fan, it wasn't an overtime goal that will always resonate - but it was a pivotal play at an incredibly crucial time, and as we approach the 20th anniversary of that moment, it's hard not to look back and revel in the same sense of awe that I had while watching on television that fateful evening. Scott Niedermayer was born and raised in western Canada, and began turning heads during his first season in junior hockey. Playing defense for the Kamloops Blazers of the Western Hockey League, Scott would score 69 points (14 goals, 55 assists) in 64 games to help them win the league's championship. He was only 16 years old. The next season saw Scott improve upon those statistics, with 82 points (26 goals, 56 assists) in 57 games, making him one of the top prospects heading into the 1991 NHL Entry Draft. Due in part to a fortuitous series of events, the most notable being a hotly debated trade from two years prior, the New Jersey Devils selected Scott with the 3rd overall pick in the draft. Niedermayer would play only four games with the Devils as an 18-year-old, returning to Kamloops to once again lead his team to the Western Hockey League championship. From there, he would go on to win the Most Valuable Player award during the season-ending Memorial Cup tournament, as his team captured the championship of the Canadian Hockey League. Ready to make his mark in the NHL, Scott flourished during his first two seasons in the league - he was named to the All-Rookie team in 1992-93, and was a key contributor as the Devils had their best season in franchise history the following year (they would come within one game of reaching the 1994 Stanley Cup Final, before suffering a heartbreaking defeat - in double overtime of Game 7 of the Eastern Conference Final - to their arch-rivals, the New York Rangers). A league-wide lockout would delay the start of the 1994-95 season until the following January, and the Devils concluded the season by finishing in second place in the Atlantic Division for the second consecutive year. While the continued adaptation of head coach Jacques Lemaire's tight defensive structure inhibited the offensively-gifted defenseman from posting impressive statistics during the compressed 48-game schedule, Scott proved more than ready to handle the pressure as the spotlight grew stronger going in to the Stanley Cup Playoffs. New Jersey's fifth-place position in the Eastern Conference meant they would start the postseason on the road against the Boston Bruins - but, as history would eventually show, the Devils found no disadvantage while playing in visiting arenas that spring. New Jersey would go on to dispatch the Bruins in five games, winning all three road contests in the historic Boston Garden (the final season of its existence), before eliminating the favored Pittsburgh Penguins in five games in the following round. The Eastern Conference Final saw the underdog Devils matched up against the Atlantic Division champion Philadelphia Flyers, led by league MVP, Eric Lindros. Once again, the Devils defied the odds and were victorious in six games, prevailing in all three road games in Philadelphia. For the first time in team history, the New Jersey Devils would play for the Stanley Cup. Meanwhile in the Western Conference, the Detroit Red Wings were demolishing the competition, eventually winning the Presidents' Trophy and entering the playoffs as the conference's #1 seed for the second straight year. The playoffs proved no different, as the Red Wings would cruise through the first three rounds while only losing two games (neither of which occurred at home in Detroit), and emerged as the clear-cut favorite when the Stanley Cup Final began in June. The truncated schedule from the shortened season would prevent the Eastern Conference teams from playing their Western Conference adversaries during the regular season, so the Final matchup did give the Devils an element of surprise - this was somewhat evident during Game 1, as New Jersey's suffocating defense stifled the high-powered Red Wings, allowing Claude Lemieux's 3rd period tie-breaking goal to stand as the game-winner in a surprising 2-1 victory for the visitors. The Devils were now 9-1 in road playoff games, and Detroit had lost at home for the first time in the postseason. Though he was absent from the score sheet that evening, Scott Niedermayer saved his best performance for when the series resumed three nights later. The most interesting piece of news going into the game was that the Devils would be inserting Jim Dowd into the lineup, after he was a healthy scratch for Game 1. 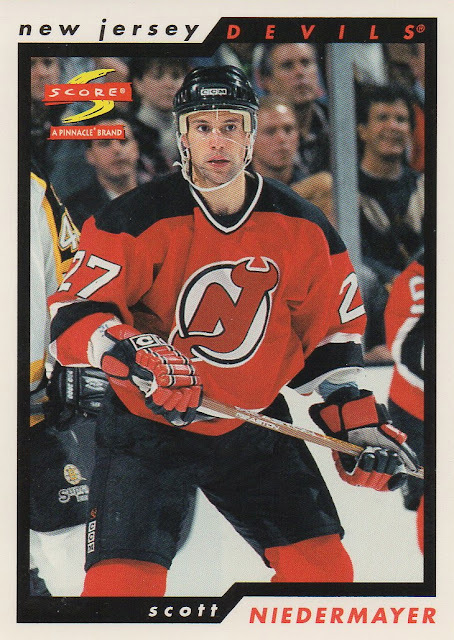 Hailing from Brick Township, Dowd was the first New Jersey native to play for the Devils, and he would prove to be an important contributor during this memorable game - even as Scott Niedermayer used the same platform to vault himself into the consciousness of the hockey world. Seeking to even the series, the Red Wings came out energized and forced their physical presence onto the Devils. Not to be deterred, Neidermayer was playing like a man possessed - he was flying around the ice, jumping in to several offensive rushes, only to dart back on defense and use his body to knock Detroit players off the puck. He played like a man that was fully aware of the importance of stealing the first two games of the series on the road, rather than simply settling for a 1-1 split. However, the first sign of adversity came seven minutes into the 2nd period, as Detroit would score the game's first goal during a power play - Scott was on the ice killing the penalty, but was helpless to stop Slava Kozlov from tapping in a rebound to give the Wings a 1-0 lead. Two decades later, it still gives me chills. - Deflects the puck OUT OF MID-AIR past a sprawling Mike Vernon and into the Detroit net. While Jim Dowd's goal may be considered more dramatic, I maintain that it wouldn't have had nearly the impact without Niedermayer's heroics from earlier in the period (it's also interesting to note that Dowd's game-winner was the only goal scored that night in which Niedermayer was NOT on the ice). Stephane Richer would add an empty-net goal moments later to seal the 4-2 victory, sending the Wings fans home in a confused bewilderment. Ultimately, those fans would not get the chance to see their beloved team on home ice again that season, as the Devils completed the series sweep by crushing Detroit in the next two games in New Jersey, winning their first Stanley Cup in franchise history. 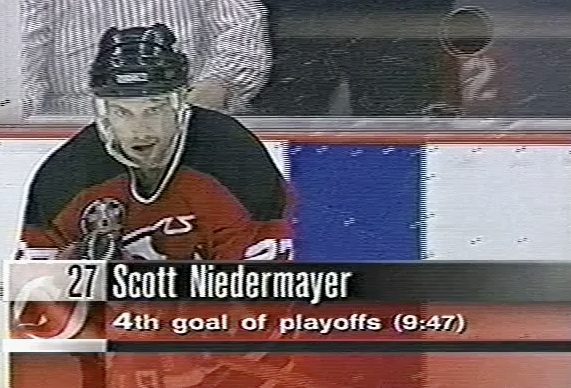 To this day, I'm still convinced that Niedermayer's goal lifted the tide in the Devils favor and they never looked back. * As of this writing, there are SEVEN players from this game who have been enshrined in the Hockey Hall of Fame: Niedermayer and Scott Stevens from New Jersey; and Steve Yzerman, Paul Coffey, Dino Ciccarelli, Mark Howe and Slava Fetisov from Detroit. That number will soon rise to TEN, with this year's expected selection of Red Wing teammates Sergei Fedorov and Nicklas Listrom, and the inevitable induction of Martin Brodeur, once he becomes eligible in the near future.